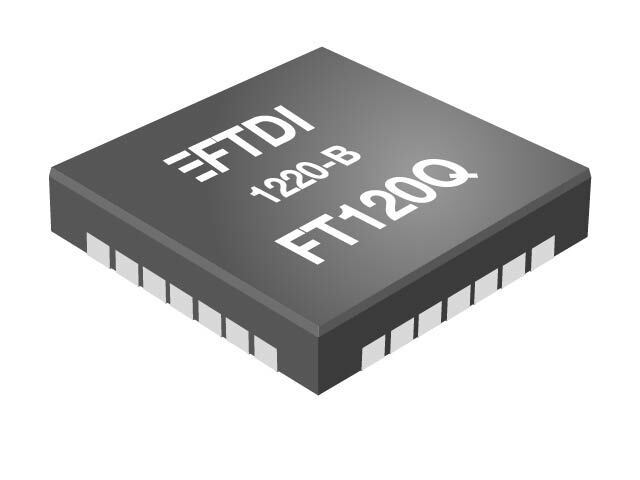 The FT120 provides a cost and feature optimized USB full-speed device controller. The design closely matches the PDIUSBD12 and may be used as a drop in replacement for the device. Communicating with a micro-controller over the generic parallel interface the device will appear as another memory device on the processor bus, offering USB connectivity with bulk, isochronous or interrupt endpoints. Double buffer scheme for main endpoint improves data transfer rates. USB transmit and receive activities. Single power supply operation at 3.3V or 5V. Extended operating temperature range : -40°C to 85°C. Available in Pb-free TSSOP-28 and QFN-28 packages (RoHS compliant).